Carmelo Anthony (7) led all players with 35 points Sunday. NEW YORK (AP) — No 62-point game for Carmelo Anthony on Sunday. He didn’t even match his first-half total from Friday night. He didn’t have to, with the Knicks offering him plenty of support for a change. 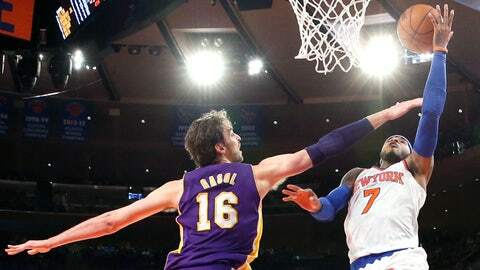 Anthony scored 35 points, four teammates had at least 13, and New York beat the Los Angeles Lakers 110-103 on Sunday. Anthony finished with two points fewer than he had at halftime of his record-setting night, but he scored six straight New York points down the stretch after the Lakers cut the Knicks’ lead to two with just over 5 minutes left. Raymond Felton scored a season-high 20 points, rookie Tim Hardaway Jr. had 18 and J.R. Smith 16 for the Knicks, who won their second straight following a five-game losing streak. Tyson Chandler had 13 points and 14 rebounds. Jodie Meeks scored 24 points for the Lakers, but he was shut out in the fourth quarter after scoring 16 in the third. Pau Gasol had 20 points and 13 rebounds as the Lakers dropped their fourth straight to finish 2-5 on their Grammy Awards road trip. Last year we had five guys that averaged in double figures and I’ve always wanted a team where you just didn’t know where it was going to come from. And we know Melo’s going to get his, but we need everybody to be a part of the offense and touch the ball and feel good about themselves. Anthony’s 62 points against Charlotte were a career high, most in the NBA this season and most at the current Madison Square Garden, one more than Kobe Bryant scored five years ago. Lakers coach Mike D’Antoni, who coached Anthony in New York, said the key for the Lakers was to contain everyone else, knowing Anthony would score. Bryant is still unable to play as he recovers from a broken left knee. He said he called to congratulate Anthony after Friday’s game, and though he stressed his appreciation for MSG, said having the building record wasn’t particularly important to him. He also noted that Anthony, who will become a free agent this summer, may have to tell the Knicks he won’t settle for being on a non-contender, as Bryant did with the Lakers, and that the talent around him needed to be upgraded. It was good enough Sunday until Anthony took over. He followed his own missed shot with 4:52 left, made a jumper and then scored on a drive that pushed the Knicks’ lead to 105-98 with 2:33 to play. Manny Harris scored a season-high 18 points for the Lakers, who stayed in it until late by making 12 of 18 shots in the third quarter, including 6 of 7 from behind the 3-point arc. But they gave up 21 second-chance points to lose despite shooting 52 percent from the field. ”It kind of oozed away. It wasn’t one thing. It was a lot of little things,” D’Antoni said. The Lakers scored the final nine points of the first quarter, shooting 57 percent in the period to lead 25-22. It was tied at 45 late in the second before Anthony made a 3-pointer and a jumper, and the Knicks led 51-47 at the break. Notes: Bryant is due to have his knee examined after the Lakers return to Los Angeles. He said he was anxious to do something besides ride the stationary bike. … The Knicks still have home games remaining against Boston on Tuesday, Cleveland on Thursday and Miami on Saturday to finish their eight-game homestand.